I’ve decided to make something from those cherries that I picked last month. The French dessert, Cherry Clafoutis, is one of my favorite desserts to bake, because it’s super easy. For today’s baking, I used the Cherry Clafoutis recipe from the food blog, Simply Recipes. Clafoutis is basically a baked custard dessert that can be made with a variety of different fruits. It can also be made into a savory side with cherry tomatoes and cheese. However, I love making Clafoutis the traditional way with cherries. Another favorite of mine is a Strawberry Clafoutis when it’s strawberry season. 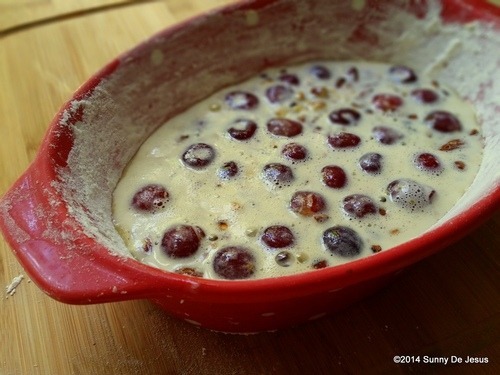 Recipe for Cherry Clafoutis by Simply Recipes guest author Garrett McCord. 1. Preheat the oven to 350F. Butter and lightly flour a 9X9 or 10X7 baking dish. 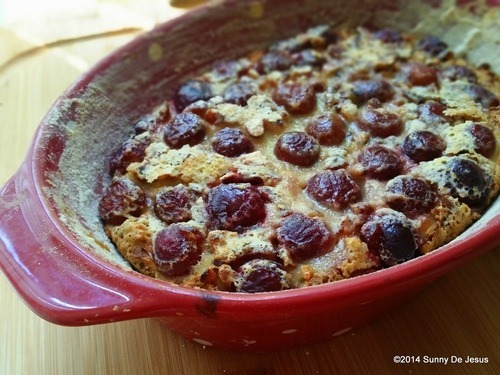 Toss in the cherries and slivered almonds. 2. Whisk the eggs, sugars, salt, and flour together until smooth. 3. Add the milk, Amaretto (or almond extract, if using), and vanilla extract. Whisk until smooth. Pour into the baking dish. 4. Bake for 40-50 minutes or until lightly browned and a toothpick inserted into the center comes out clean. When you pull it put of the oven it will wiggle a bit which is normal. Place on a wire rack to cool. The clafoutis will have puffed up quite a bit and will deflate while cooling. When cool dust the clafoutis with powdered sugar. Serve.